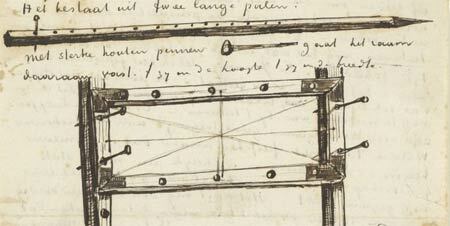 "During a significant part of his career Van Gogh worked using a perspective frame, a centuries-old artistic aid. The frame could be secured to one or two supports at eye level. Van Gogh would view his subject through the frame and on his blank sheet of drawing paper or canvas would sketch the lines that corresponded to the wires and edges of the wooden frame. In this way he was able to make an accurate assessment of the depth of field and the proportions of his chosen subject and to render these correctly onto a flat surface." So two things about the perspective frame intrigue me. One is that it is a tool to learn while you are doing. What do we who are writers have that does that? More than the writing itself, I mean. (My friend Laurie says each book teaches you how to write that book.) And the second is that it is a tool that frames a scene for you, or helps you frame it, I should say, depending on where you place it. Go, stand up, and look out the closest window. That's a frame into your outside world, isn't it? If you wanted to paint that scene, the window frame (or a single pane if you have a multi-paned window) would help you put things into perspective (even without the wires) and also frame it for you in a way that would help you see it more clearly and, I think, even more beautifully. Recently on a panel someone asked me why I decide to write something as nonfiction or fiction, as picture book or long-form narrative book. I answered that usually the project told me itself (Ok, that sounds weird, but you know what I mean) what shape it wanted to be. But that's only half the story. Once I decide on a frame, that helps me write the book. So the first frame is format and length--fiction, nonfiction, picture book, YA book, middle grade, narrative, photobiography, etc. I put my own perspective frame around it, such as in my new book, The Boy Who Loved Math. Making it a picture book ensured that I will had to carefully craft a narrative that fit into 32 (or thank you, Roaring Brook, 40) pages. That limit and the limit of the age level and the frame of a book with illustrations all went a long way into helping me shape the book. Looking through that frame every day helped me see it in a very particular way. That creates the second frame, the story I choose to tell. (With Charles and Emma, it was a love story.) Once I decide on that frame, I have to discard (almost) everything that is outside the frame. What I end up writing is from the perspective of me standing looking out my window into the world of my book. What ends up on cutting room floor is outside the frame.
" The perpendicular and horizontal lines of the frame, together with the diagonals and the cross — or otherwise a grid of squares — provide a clear guide to some of the principal features, so that one can make a drawing with a firm hand, setting out the broad outlines and proportions. Assuming, that is, that one has a feeling for perspective and an understanding of why and how perspective appears to change the direction of lines and the size of masses and planes. Without that, the frame is little or no help, and makes your head spin when you look through it." I love the idea of looking at your subjects through a perspective frame. We all carry one around with us. We just need to appreciate that each one will be different. THanks Deborah. You're welcome! And sorry, everyone, for the typo in the title earlier. Rubbing sleepies from eyes. Great point, about needing the frame - a love story, an action-adventure story - and how everything comes into focus once you have it. So simple, but hard to define sometimes. I try to get projects to talk to me, but they don't always cooperate - what's the secret? Steve, what is the secret of getting projects to talk to you? You mean inanimate objects don't talk to you? Seriously, of all people, I think you have figured out how to find the story! But that first step, setting up the frame - is it just harder for writers than visual artists? For me it seems to require so much trial and error. There's also the proscenium frame in theater, dance, opera, etc. And there's the frame of the camera lens that in some way is eerily similar to Van Gogh's. 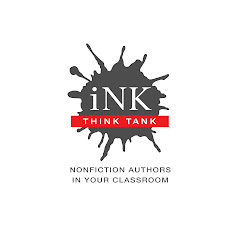 Nonfiction writers have the built-in frame called "truth." Then again, "truth" is broad canvas. Interesting, thoughtful conversation. Thanks Deb.